It’s Beginning to Look a Lot Like…Autumn? Woke to the sounds of rain this morning. Second only to the hush and muffle of snowfall, rain makes me want to put on my raincoat, grab an umbrella and get outside. Rainy skies, golden trees, no people. Perfect. Given than I think of this place as my Riparian Preserve, I loved that the place appeared abandoned when I arrived. I didn’t cross paths with a single person until the last five minutes. A photographer with a tripod making his way toward some wonderful scenery to shoot seemed a bit put off by seeing another human, as was I. We successfully ignored the existence of each other and went our separate routes. How can I possibly describe the scene today? The diffused light through low clouds muted and highlighted colors. Today’s cloud filtered light particularly played up the yellows and enhanced the grayish brown of everything else. 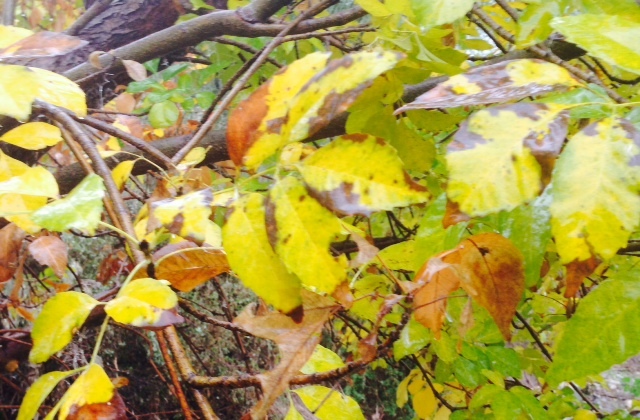 Greens, of course, seemed greener, but golds sang out in the rain-light like a soprano in a choir. Don’t take my words for it. They’re inadequate today. Stroll along with me, imagining the sound and feel of rain on your raincoat and the not particularly cold water seeping through to your wool socks. Today’s stand-in for the sun. Here in the desert autumn isn’t. We don’t really get to experience that particular season. At best we usually get a hard freeze for a night or two in late December or January which turns the deciduous leaves dark brown and drops them to the ground a day later. Nothing pretty about that. But this year serves as a delicious exception. 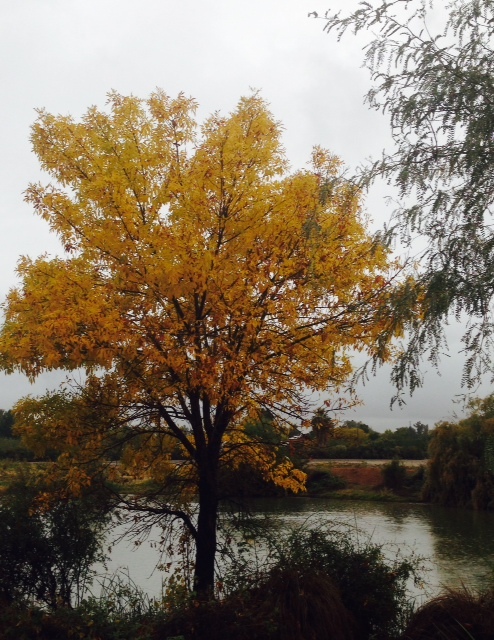 Lows in the high thirties and low forties have kissed the leaves and made them blush red or brighten to a golden hue. Droplets dangle like jewels on branches. Bubbles pop to the surface when raindrops his the water. Sahuaros drinking in the rainy day. Most of the water birds stayed quieter than usual today. I’m not sure what’s up with that. Why would rain shush them? The ducks stayed tucked in, beaks nestled under a wing while they sat or floated quietly. The night herons seemed more stoic than normal not flying off when I approached. Jumpy best describes a few of the shore birds, as if they don’t know how to behave when it rains. Not a hummingbird or yellow finch in sight, snuggled up inside their tight little nests, I’m sure. Toes and feet will definitely end up wet. Wish I could peek inside this nest. The closet thing we get to a beach view around here. Water droplets on prickly pear, quite the contrast. Tiny yellow leaves scalloped into a work of art by runoff. At times the trail was more puddle than path, but I managed. No speed walking or jogging going on here. Just a slow meander. Sure my toes got wet as I knew they would so I’d put on wool socks and didn’t mind the damp at all. I’m glad I ignored the to-do list this morning, threw on a hat over my sleep scruffy hair and spent an hour under rainy skies. Such moments happen rarely here and want savoring. 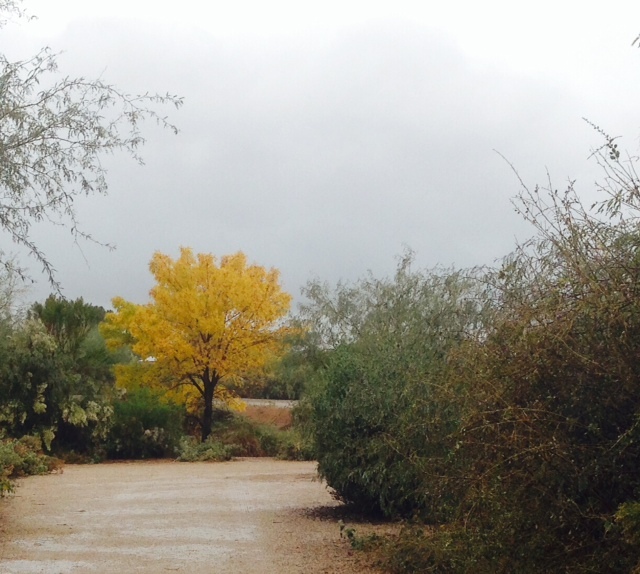 Desert Autumn or Winter rains, whatever name it goes by suits me just fine. The gold up close, seems a bit worn and ready to drop. Moisture pushes ahead of the straggling remnants of hurricanes limping far inland from the Pacific, bumping up against the northern and eastern mountains. A traffic jam of clouds fills the sky with swirling masses of whites, grays and blues. Cloud sculptures twist and swirl while light plays a melody in concert with the sound of distant geese calling out their imminent arrival. Dozens upon dozens of rabbits rush around drawing too much attention to themselves, making use of the cooler morning hours. Sun breaks through the tangled muss of fluff with bits of light but little color. Small birds twitter, tap, chatter, sing, peep, mimic, flit, flutter, flap, hum and tweet. Larger birds sit in silent patience. A pair of hawks sweep low and silent along a path searching for the unaware and unwarned. I walk, finding more than animals, birds, sky, water, shades of green. I listen for solace and a different kind of silence. I look for something within myself as I walk the dawn. Thoughts clarify with each step I travel through this oasis. I gather courage and hope as I pass the creosote, palo verde and acacia. Each morning I claim sanctuary, and emboldened, face the day. It’s Gratituesday! On Monday morning I wrote up this little missive and decided to wait and share it with you today. It sums up my gratitude for this week quite nicely. I forgot to set my alarm last night, but my brain knew when time to wake up arrived and rousted me from dreaming anyway. Good thing, too. It stormed a bit overnight, so the humidity soared and the desert heat cooled somewhat. Remnants of clouds still hung out on the horizon in every direction. I got some picturesque shots of the sun and sky dancing like they do some mornings. Corals, golds, a touch of silver with an azure backdrop. A nearly perfect sunrise, wouldn’t you agree? Besides capturing sunrise photos, I keep my eyes alert hoping to sight an elusive family or two of Quail, or perhaps my favorite bird the Night Heron. The Hummingbirds have been extra active lately zipping about catching insects. It’s a typical morning walk for me. Off to the right in a small pond, stood my friend the coyote. I see him about once or twice a week in different spots throughout the Preserve. He was standing half in and half out of the water, looking intently into the bushes to the north. It would make a nice photo, so I stopped to line up a shot. The coyote bounded like a rabbit toward the bushes, playful and boisterous. I’d never seen him do that before. Suddenly he raced back toward the pond edge. Then he wagged his tail and pounced forward again. His head and shoulders clearly searching the brush for a glimpse of something. A leap, a tail wag, and more bouncing. Then he kept his hind quarters up and leaned his front end to the ground, like a pup ready to chase a stick. He was playing a game with something in the bushes. Oh, for a better zoom on my tiny camera. 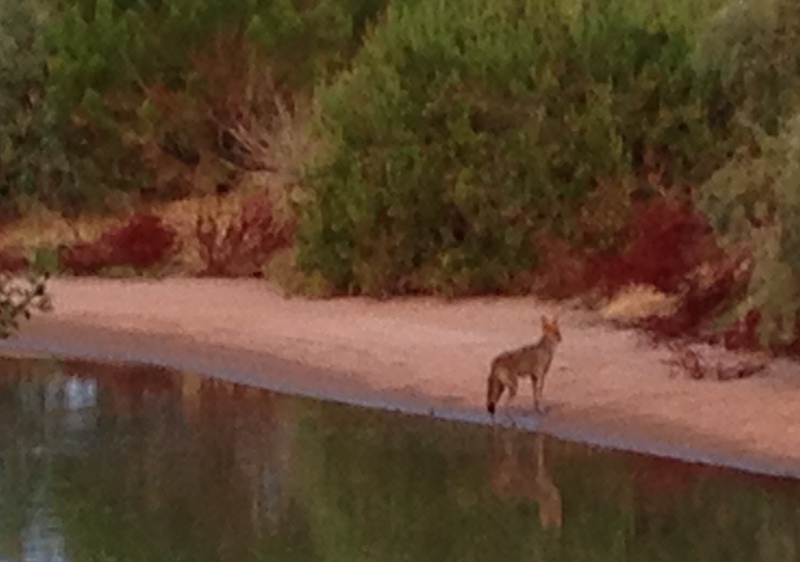 I stood there mesmerized watching this coyote revel in a game he’d made up. Then, suddenly he pulled his tail between his legs and raced back to the water. Then he ran east, as if the game had come to an abrupt end. He wandered toward the back side of the bushes he’d been so interested in, when another coyote appeared. Larger, and looking somewhat menacing, ears back, body low to the ground and moving lower, as if ready to launch at some prey. Uh oh. I thought. The younger coyote’s ears perked up, his tail wagged, he ran back and forth not ten feet away from the larger one’s attack stance. Then the ears perked up on the bigger coyote, the pup raced in large circles, jumping and dancing, prodding the other to play. Mother and child. That’s what this was. The younger coyote raced and raced, tail wagging, delight in every movement, until the older one slunk back into the bushes. They fell out of sight, momentarily emerging to race into the water briefly, then they were gone. What a gift to see such wild abandon not a mile from my front door. The rest of my ninety minute walk hummed with the joy of what I’d experienced. Sure, sweat dripped off my head and hair, ran down my back, soaked my clothes. And yet, a breeze blew down the path occasionally, working with the damp on my body to create a miniature swamp cooler bringing temporary relief from the morning’s desert heat. I welcomed every patch of shade offered, lost count of the rabbits and crossed paths with very few humans. I hesitated to end my walk even as the temperature rose and fatigue increased. I didn’t want to let go of what I’d felt, what I’d seen in those rare and, yes, sacred moments between mother and child. Nothing compares to that ephemeral time shortly before and just after the sun rises. The earth transforms from dark night to a brief otherworldly dimension of surprise and wonder. Such a morning makes any shortage of sleep a very minor inconvenience and fills me with a sense of gratitude that ought to last a very long time. It’s Gratituesday! Today I’m grateful for the amazing variety I find in the world. There’s nothing like an Arizona sunset. 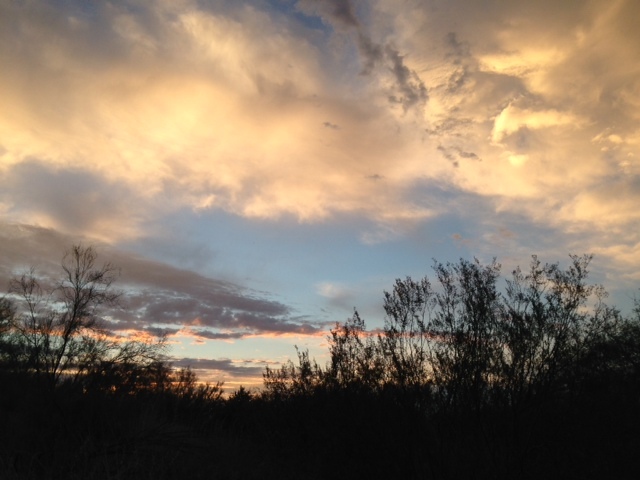 Yesterday MSH and I took a sunset walk through my favorite local sanctuary, the Riparian Preserve at Water Ranch. I’d worried it would be too hot, as the temperatures had been in the nineties all day, but a good breeze kicked in and some clouds danced about keeping things pleasant. Add in the shade inherent in the low angle of the early evening sun and we had perfect conditions for a stroll. I used to walk here every single day for a year or two. I laid claim to certain aspects of the place. I recognized some of the photographers that regularly wandered about. I noticed differences in duck families and became well acquainted with a gaggle of geese that acted like they owned the place. I knew most of the daytime locations of the night herons, recognized shifting water levels, and avoided visiting at times when crowds would be there. Then life happened and my visits there dropped to almost never. Once every three months or less. Last night I realized I hardly recognized the place, particularly with its late spring green rush making everything so bright and perky. My walks used to happen in the early morning hours, before the sun even broke across the horizon, so seeing it all in early evening very literally made me see things in a different light. I couldn’t seem to snap enough photos. From the pink Prickly Pear cactus, to the rare leaves and flowers on an Ocotillo, the variety stood out. Take a look and you’ll see what I mean. Plenty to be grateful for around here, as far as I can see! Verdant shade reaching across the path. Pink Prickly Pear. Amazing color, yes? A new island in this pond. The birds will be happy for the upgrade. This is the kind of trees a desert riparian area can support. Huge, luscious, and shady. If I didn’t know better I’d think I was anywhere but in the desert. Ocotillo with leaves. A rare sighting. Usually these just look like dead spiny sticks. Amazing pink flowers that the hummingbirds adore. Vibrant coral in a sea of green and gray. Two similar trees with completely different flowering properties. A Heron and an Egret passing like two ships in the night. The world continues to surprise me with its resilience, beauty and variety. Even in the desert, as the temperatures hover near one hundred, nature delights me with her wonders. African Daisies still going bonkers in a few spots. My wildflowers reach the end of their life cycle this month. MSH keeps insisting I just need to water them. To appease him, I have drenched the poor worn out plants with copious amounts of the precious resource, to no avail. Well, that’s not exactly true. The weeds appreciate the extra moisture and show their appreciation by growing a foot in a day, or at least it seems they do. No, sad to say, my wildflowers have simply reached the stage in their life cycle where they produce seeds and then let the winds scatter their progeny willy-nilly. By time a healthy seed head appears, the plant itself has given its all, nearly five months from peeking out of the ground to now. This seed head looks promising. Now’s the part of the wildflower process where the hard work kicks in. If I want to share any of the seeds, which I like to, then I gather the puffs of seed heads into a bucket and distribute them into Ziploc bags. These little guys, African Daisies, will grow in almost any climate, even in a regular garden bed during late spring and summer, as long as they get the full sun. It’s a little trickier gathering the California Poppy seeds. They form in long pods after the flower bloom ends. The seeds aren’t much bigger than a grain of sand. I gather the pods before they open and let them dry out in a container. When the seeds are ready the pod splits open on its own and releases the seeds where they fall to the bottom of the container. The other much harder part of wildflowering in my rock covered desert landscape is that every plant must be plucked from the ground and disposed of. Usually I pull a few plants a day as they slowly die off, which isn’t too difficult. But this year, there are more plants than ever and we had a really hot patch of weather last week that sped up the process of end of life. So I’m faced today with the task of cleaning up the dead and dying. It’s a little sad. The yard starts to look bare and desert-ish again. My flowerpots in the shade of the front porch provide my only color fix out there. Yet in this undertaking (excuse the pun) I have hope, because hundreds or probably more like thousands, of seeds have fallen among the rocks and next years bloom looks promising. I suppose what I love about wildflowers lies in their self-propagating properties. They voluntarily show up, without any work on my part. I once had a tree seed blow in and grow in the middle of a series of garden beds. Turns out it was a Brazilian Pepper Tree that grew very quickly. In a matter of three years I had a tall, full tree that provided shade for a south-facing kitchen window. Another time, in the middle of a compost pile, I had a cantaloupe vine grow that gave out the sweetest fruit I’d ever tasted. Unplanned color in my garden. All winter I had meant to plant vegetable seeds in the open spaces of my back yard flower bed; combine utility with beauty for a perfect combination. I set in a few tomato plants, but that’s all. The deliberate planting never happened. Life and death and illness took hold for a while and got in the way of my good intentions. And yet, almost miraculously, my back yard flowerbed overflows with nearly all volunteers this spring. Some flowers simply survived the very mild winter, with only one night of below freezing temperatures covered by a sheet. The red Penstemon apparently throw out seeds because they’re spreading and blooming proficiently. A few Sunflower seeds planted themselves from last years batch and have made themselves comfy among the Romaine lettuce and Petunias. Marigolds reseeded themselves as well and threaten a yellow takeover once they start blooming. And Cosmos, with their feathery stalks have already flowered in neon pink, the children of last years few seeds I tried for the first time. Looking out the back window provides a view of this unplanned but stunning flowerbed at all times of the day. Not being in too much of a gardening disposition this past winter, I’ve been lucky to have so many plants volunteer to brighten my life. Sometimes, in spite of lack of attention, or maybe because of it, nature sends surprises to delight and lift and cheer.